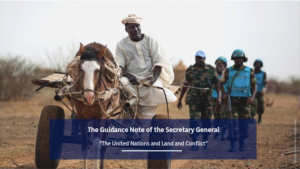 On Friday 15th of March 2019, the Secretary-General António Guterres endorsed the Guidance Note of the Secretary General on “The United Nations and Land and Conflict”. This is a milestone in the journey towards a sustained and coherent engagement of the UN System on land and conflict to prevent conflict and sustain peace. Developed under the leadership of the Global Land Tool Network and UN-Habitat in collaboration with a Core Group of UN agencies including DESA, DPPA, DPO, FAO, OHCHR, PBSO, UNDP, UNEP, UNHCR and UN-Women, the Guidance Note is significant. For the first time, a systematic review of the UN system’s engagement on land and conflict was undertaken and from this, a coherent approach to address land issues to prevent, mitigate and resolve conflicts was developed in the form of the Guidance note. Ample evidence shows that land is one of the key root causes of conflict and underlying factors hindering recovery and sustainable peace. In many countries, conflict management and resolution are often at the heart of UN and partners’ operations and land is one of the underlying factors that, so far, has not been tackled adequately. The criticality of the land and conflict nexus is only likely to increase in the coming years with the growing pressures of climate change, population growth, food insecurity, migration and urbanization. Recent UN reform efforts on peacebuilding and peacekeeping have called for more attention to root causes of conflicts and integration among the UN pillars of peace and security, development and human rights. The Guidance Note recognizes that land is fundamentally relevant across the three pillars and along the peace continuum from conflict prevention and resolution to peacekeeping, peacebuilding and long-term development. It also offers guiding principles and a framework for action to improve the capacity of the United Nations to prevent, mitigate and resolve conflicts by addressing land issues in a more coherent and systematic way. The UN system will continue to gradually map and develop the capacities of the United Nations system to address land and conflict issues and to include land as part of joint conflict analyses that guide strategy development and programming at country level. There is also a commitment to further engage and support Member States on land and conflict, bilaterally and through their work in the Peacebuilding Commission and the Global Donor Working Group on Land. Finally, with the review of SDG 16 (peace, justice and strong institutions) on the agenda of the High-Level Political Forum in July 2019, the Guidance Note will help make explicit the link between conflicts, climate risks, natural resources’ management, displacement and land. We celebrate the UN for embracing this Note, thank GLTN Partners including UN-Habitat for their contribution to the Note and look forward to working closely with UN agencies and GLTN partners to mobilize resources and increase our joint action on land and conflict at the country, regional and global level. This will benefit millions of people directly affected by conflict every day.